Hunting for bushmeat is as old as the forest and the appetite to eat, but now there are more people , more weapons and a bigger appetite. 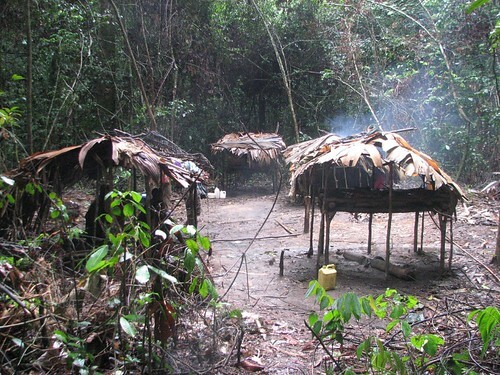 A rack for drying and smoking meat is the center of this hunting camp in the Lomami forest. I remember 20 years ago driving from the Ituri Forest to Kisangani. Even then, when the roads were “good”, it was a 12 hour drive. (A view of the current road deterioration, HERE.) We stopped for lunch at the open-air restaurant on the Lindi river. The “plat de jour” was okapi. The Lindi villagers set their wire snares for large antelope and buffalo. But snares don’t choose. 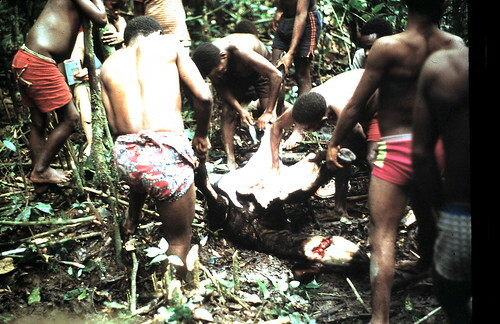 When they checked their trap line, the okapi’s fetlock was wrenched tight and its leg was mangled. So be it. That size and grade of wire was relatively uncommon in the central Ituri Forest, but already in the mid 1980’s okapi had been trapped out of the forests of northern Equateur where the towns were bigger and busier. During the war years of 2001 and 2002, stalls in the meat section of Mambasa’s central market were piled high with large hunks of smoke-blackened elephant meat. The whole town was eating elephant supu with their manioc fufu. Rogue soldiers with ammunition to spare were stocking ivory to sell in Uganda; the meat was a small extra bonus sent in piles on bicycles down to Mambasa. Elephant meat became cheaper than chicken. Uncontrolled armies with a surfeit of ammunition were new to the Ituri and so was this greed for ivory that splintered elephant families. 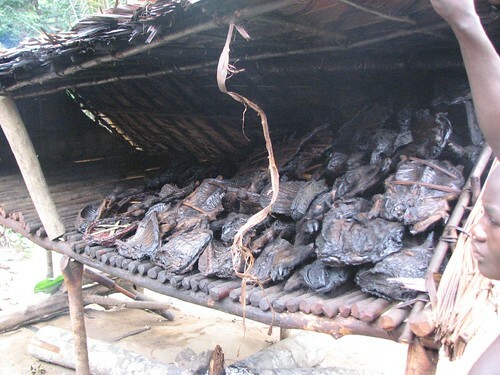 Bushmeat is not history and it is not war – bushmeat is here and now a primary part of many people’s diet in Congo. If you have some money and live in the town, you eat bushmeat. It tastes better than beef and it is more like home, the village. If you live in Congo forests you don’t even need money, just a bit of wire for a snare, or a spear or an arrangement with the military that will get you access to a gun and ammunition. We are not going to stop bushmeat hunting tomorrow. Not possible, but rather than give up, let’s just adjust the strategy and set goals by place and by species. 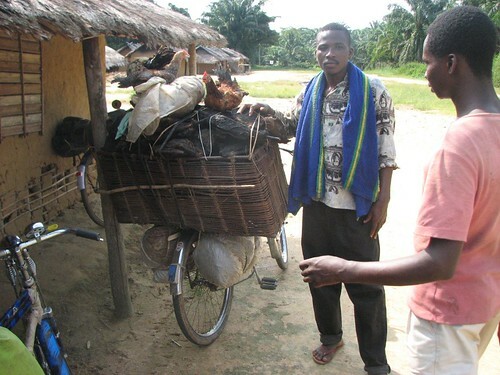 A merchant is transporting bushmeat by bicycle out of the Lomami Forest to Opala or Bimbi and from there it will move on to Kisangani. 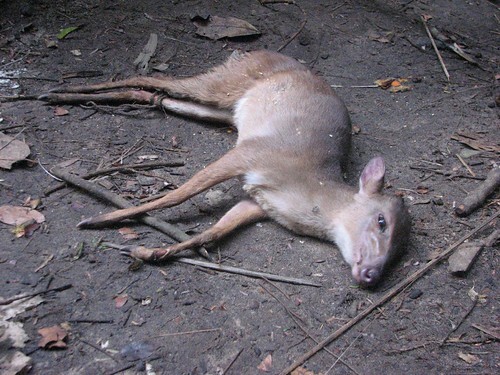 Places where we can really hope to stop all bushmeat hunting are national parks and national reserves. If the law says NO HUNTING in a clearly defined area and if there are park guards representing the law, surrounding villages can accept and respect the restriction. This has been shown with enough success in enough parks in Congo (not without challenges, see gorilla posts) to make it worth backing. Species that we could hope to protect everywhere, and not just parks, are the easily recognized, easily avoided, and clearly special species. Neither special places nor special species are an automatic win in Congo (or anywhere) but they give us a strong hand, they tilt the balance, they make it possible. More about “not-in-the-pot species” in the next POST — day after tomorrow. This entry was written by Terese Hart, posted on 2008-02-01 at 1:12 am, filed under Bushmeat, Elephant. Bookmark the permalink. Follow any comments here with the RSS feed for this post. Post a comment or leave a trackback: Trackback URL. Yes, a sound proposal with goals that can be attainable and measured. That being said, did you guys know that bushmeat can be found on the menus of some of Europe’s capital cities, like Paris (large African population there) and in New York and Los Angeles? Now, we all know that the Hiv Virus originated in African monkeys and then jumped to chimps (who ate the monkeys) and then spread to humans after handling or injesting bushmeat. Yes I said handling, scary eh? The Ebola virus also tranmitted from primates to humans. New simian viruses are now being found in poachers and people who eat bushmeat. Now let’s discuss the 800 pound gorilla (or elephant, since they are both victims here of the bushmeat trade) in the room; the world’s looming population crisis. What to do about it?! Yes, it is the looming problem. With enough habitat loss from growing and spreading human populations, controlling bushmeat hunting won’t save the animals. Terese, is practising birth control taboo there, or is it a lack of funding and education? Your previous post highlighted empowering the women, but I learned from the IRC that many women have little or no say in “bedroom issues” which probably leads to many unplanned pregnancies. True, very true. Birth control is not widely available. There is a strong fear of taking more permanent steps because of high child mortality. And, alas, still inn many of the dominant groups the worth of a woman is in her fertility. Women who rise above that have had a vertical climb. Just wanted to add something on the birth issue. i knew a guy here who worked with me out in Salonga NP (where I worked before this project). He had a wife who could not have children so he took a second wife to have children with. Here they see nothing wrong with that but if you do not have children they see something very wrong with that. So to do something about birth control here is going to be extremely difficult. They do also have an incredibly high infant mortality rate. I have personally never seen so many funerals for children in my life. Very sad indeed. Thank you Terese and Ashley, for opening my eyes on this issue. I can READ about this, but you guys are there, seeing the reality for yourselves.